I know, I know. Knitted socks, in SUMMER? But seriously. One of the great features of wool is that it regulates temperature – it keeps you warm when it’s cold, and it cools when it’s hot. Pretty handy, isn’t it? Fine Art is Rowan’s first handpainted sock yarn, and may I say so, it is my new favourite. It’s a blend of wool, mohair, silk with a dash of polyamide to make it more durable. I don’t know who first had the idea of adding silk to a sock yarn, but whoever it was is a genious. Silk is a strong fiber, and it feels amazing in combination with the mohair. Seriously, you’ll never want to wear socks that are made of anything else again. They’re so.. slinky. And a little fuzzy at the same time. I love mohair, wearing a garment made from this fibre is a bit like carrying your favourite pet around with you 24/7. The fibres for this yarn are sourced, spun and hand painted in South Africa. If you’d like to know more about the process of creating Fine Art, check out the story behind creating it. My favourite of the Fine Art colours is Lapwing, a beautiful blend of green shades. 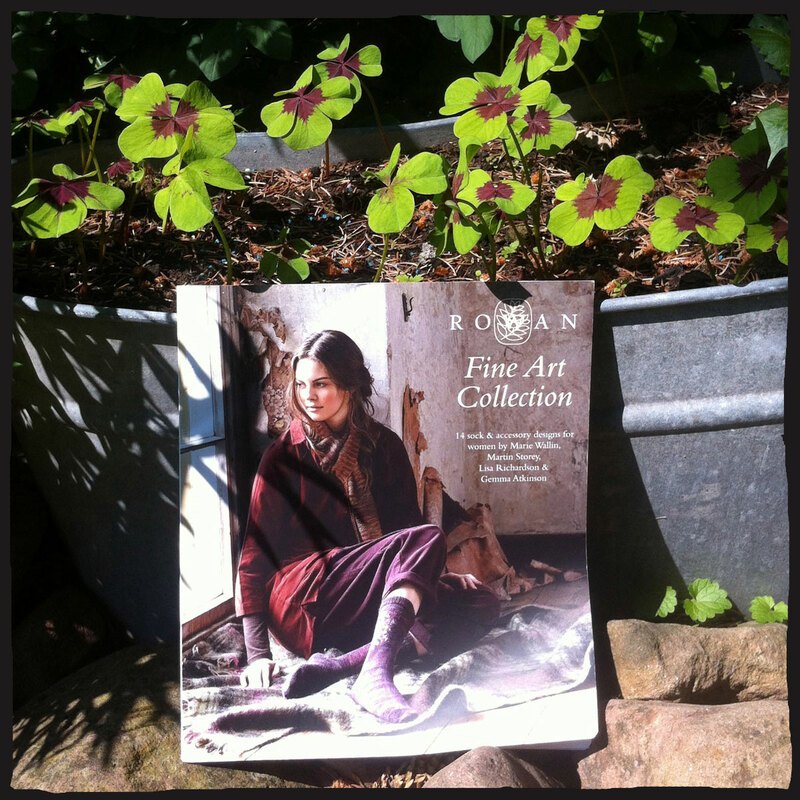 I was so happy when I opened the package to find Rowan had sent me just this colour together with the Rowan Fine Art Collection book. The skein itself looks like a piece of art, the colours are brilliant and thanks to the silk it shines and reflects the light like a gemstone. I am actually thinking of ordering another skein just for the sake of displaying it, that’s how pretty it is (there goes my resolve not to buy yarn this year until my stash has been reduced considerably – oops). Rowan Fine Art Collection contains 14 designs made with Fine Art Sock yarn, but don’t you think they’re all just socks. It’s a mixture of beautifully patterned scarves, wraps and several sock designs by some of Rowan’s favourite designers Martin Storey, Gemma Atkinson, Marie Wallin and Lisa Richardson. 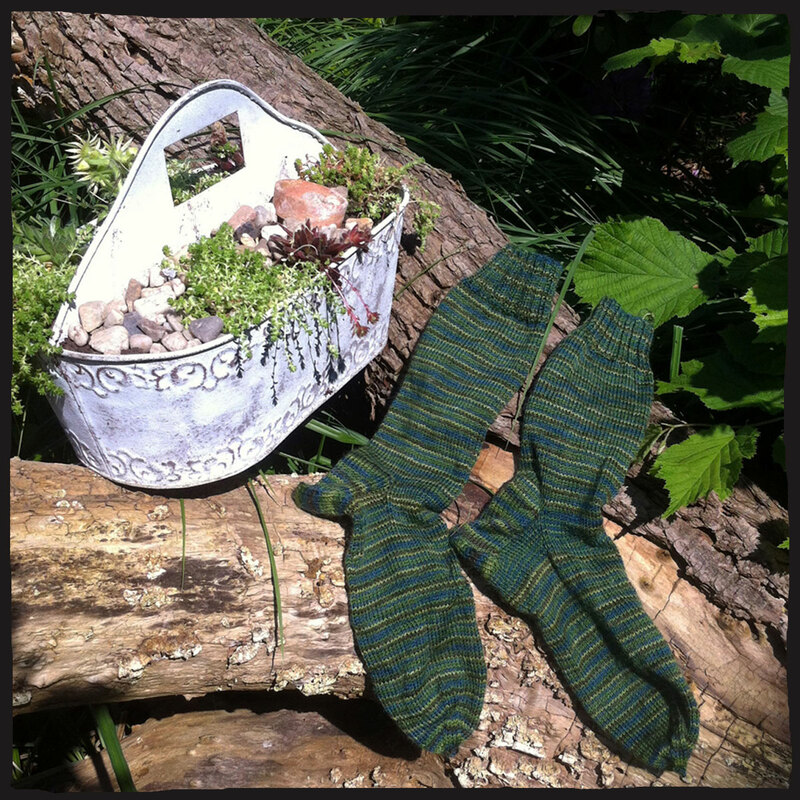 I am in love with Warbler, a pair of overknee socks designed by Gemma Atkison. Alas, this is a rather time consuming project using three skeins of Fine Art and knit with cable details, so I decided against making it for now as I have been working on so many different projects recently and just wanted a quick fix that meant I could knit on the go without having to follow a pattern. I’d really love to make these socks, but am hoping Rowan will bring out Fine Art in Solid colours in the future. I’d love to wear the socks with a dress or skirt so you can actually display the beautiful yarn and pattern, however personally I find the handpainted colours are a bit too busy for a piece that will already draw lots of attention simply because of the gorgeous design. Knitting with Fine Art was an absolute pleasure, the yarn is so silky it glides through your fingers easily and knits up relatively fast despite being knitted on 2,5mm needles. It creates a sturdy yet very delicate and soft fabric, and just holding the finished socks makes you want to put them on immediately. I actually had strangers coming up to me while knitting on the train asking about the yarn and wanting to touch the socks. I don’t think that’s ever happened to me before. One skein is enough to make a pair of adult size socks, I am a size EUR40/UK7/US9 and I had quite a bit of yarn left as well after finishing.